Astralis' Counter-Strike: Global Offensive team will not attend DreamHack Masters Dallas or Intel Extreme Masters Sydney. The news came with the announcement that the final invited teams to DreamHack and IEM would be Cloud9 and Fnatic respectively, quashing hopes of a surprise last-minute reveal of Astralis. Astralis are scheduled for appearances at the BLAST Pro Series of short tournaments in cities around the world. 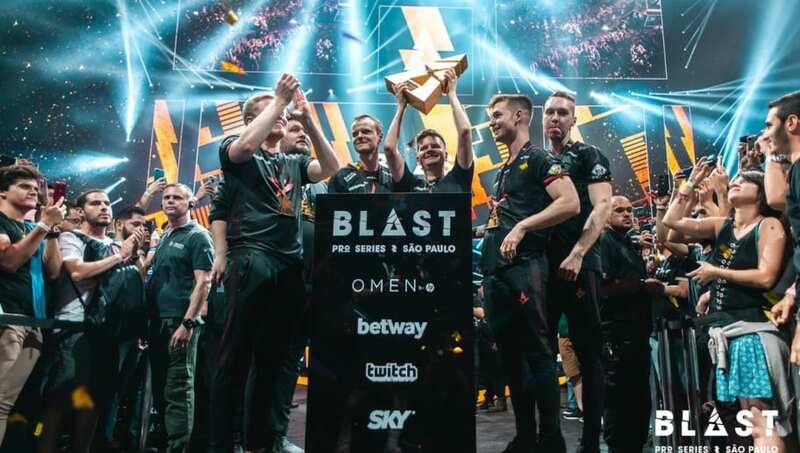 The team attended and won BLAST Pro Series: São Paulo 2019 earlier in March and will attend Miami in April and Madrid in May. This means that between their victory at the IEM Katowice 2019 Major and their upcoming appearance at the Face It Esports Championship Series (ECS) Season 7 Finals in June, Astralis will see no non-BLAST competition other than their group stage matches for the ESL Pro League (EPL) Season 9 Europe. It's Tuesday, and it's time to take another look at the World Rankings! Astralis are the undisputed best team in CS:GO and possibly all of Counter-Strike history. In website HLTV's world rankings for CS teams, Astralis sit at #1 for 70 consecutive weeks at time of counting. Astralis are also the second team to ever win three Majors after Fnatic, and have done so in an arguably more difficult format and in more dominant fashion. For fans to not see the number one team at as many events as possible will be disappointing. But there are causes of concern beyond viewer enjoyment. Astralis have committed to appear at multiple BLAST Pro Series events over DreamHack and IEM. The latter tournaments are considered to have a stronger format than the quick weekend tournaments of BLAST, which raises questions regarding correct evaluation of Astralis's form and record. Astralis's attendance at BLAST also raises questions of conflict-of-interest as the BLAST Pro Series is organized and operated by RFRSH Entertainment, the parent company of Astralis. Further, events organized by ESL and DreamHack Masters (both part of the Modern Times Group) form the Intel Grand Slam. The Intel Grand Slam not only provides an overarching goal that ties tournaments together but also incentivizes teams to attend ESL or DreamHack events to try and win the $1 million prize by winning four ESL/DreamHack tournaments in a ten-tournament window. (The first season of the Intel Grand Slam was won by Astralis). 7 of the best teams in the world. 7 international venues resulting in one Global Final to end the year. With the news that BLAST Pro Series will have a Global Final Event, it appears that RFRSH intend to compete with ESL and DreamHack's Intel Grand Slam. The Global Final Event uses a point-based system for each tournament in the BLAST Pro Series with the top four teams invited to an end-of-year $500 thousand tournament. Between the shared ownership of Astralis and the BLAST Pro Series, the unsatisfactory format utilized by BLAST and the deprivation of seeing the world's best team compete in tournaments with more robust formats, the overall outlook towards the Danish absence is lukewarm. In isolation, it appears that Astralis intend to compete at theoretically weaker tournaments with a smaller pool of top opponents in a questionable format. In the broader context, it raises questions on industry politics between competitor tournament organizers and the conflict-of-interest that arises from a team choosing to attend the events of its parent company over others.